It’s not too late – nominate your community hero for a Philanthropic 5 or Philanthropic Youth award! Each year, United Way's Emerging Leaders award five leaders in their 20s, 30s, or 40s, as well as one person under 21, who give, advocate, and volunteer for change throughout Greater Milwaukee & Waukesha County. Today, Joseph works twice a month with a helper from United Way program partner Catholic Charities and is making progress. Read the full story here. May is Mental Health Awareness Month. "This is not an 'us vs. them' issue; it is about all of us and our mental wellness." Follow our mental health blog series from National Association on Mental Illness (NAMI) of Waukesha. Learn more about how your dollars and volunteer support help United Way fight for the health of our community. Social Spotlight: We're Halfway There! 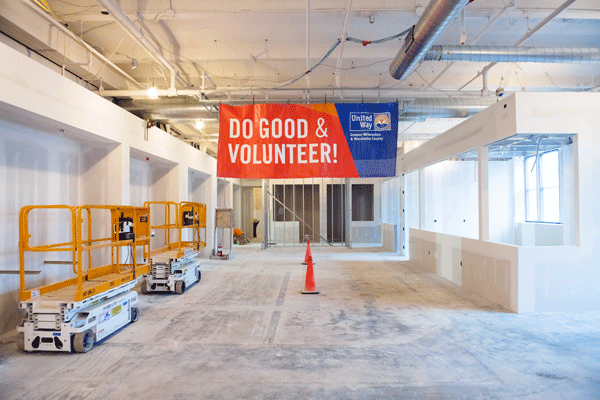 Check out the progress that has been made so far on the Johnson Controls Volunteer Center! Our Grand Opening is scheduled for August 30 as part of our 2018 Campaign Kickoff Celebration. Read more about the Center here. This resource fair is for employers interested in hiring people returning to the community from correctional facilities. Agencies preparing ex-offenders to succeed in the workplace will be on hand to answer your questions and explain why your business – and your community – will benefit when you hire returning citizens. Learn more and register. The Milwaukee LIHF Collaborative is dedicated to improving community conditions that support healthy birth outcomes. All are welcome to this meeting to learn more about the work. Event details. United Way's annual Day of Action, presented by the Emerging Leaders, is a family-friendly volunteer opportunity where hundreds of individuals in our community harness the volunteer spirit to improve local conditions and build stronger communities to live in. Sign up today!